Now I don’t normally get too political but I can’t help having concerns over the issues in Libya and how other governments are acting on it. Ill try to keep my opinion short and sweet but understand it is probably a very complicated situation with varied angles of view. 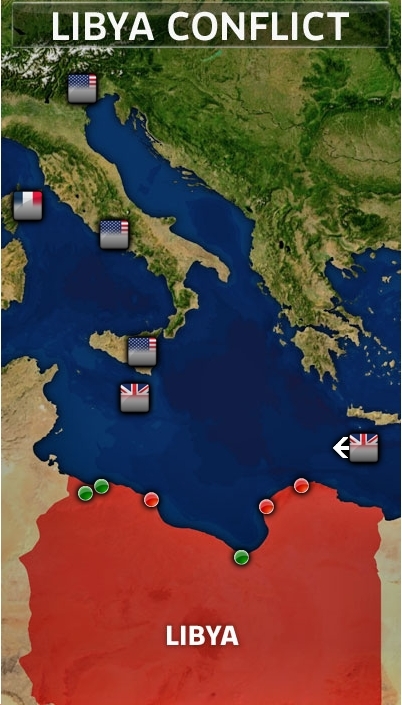 To incorporate a technology angle on the story I see today on the Sky News website we already have an interactive “Libya Conflict” map. Barely 24 hours after a no fly zone was agreed already we have a conflict. The map looks like something from Dads Army. I’m sure that this Conflict will escalate and the map will prosper but my issue is unless I am missing the point, how is it we are supporting the people who are waging war on their own government and leader Col Gaddafi? Do I assume that if I take to the streets with an anti aircraft weapon would I have the support of the United Nations? But they are being tortured and killed by Col Gaddafi’s forces I hear you cry, well maybe so but torture goes on in many countries. We are told Col Gaddafi is bombing his own people, well if they have anti aircraft guns I’m not surprised but I have not seen any hard evidence of this. Normally there are reporters bringing back video but we are told they are not allowed access to the area. The only video I have seen is of a jet bombing open space. Depending on which news article you read they was trying to bomb either the people, an oil plant or weapons dump. Warplanes are very advanced, even old Russian ones, they do not miss targets as large as a football field. I tended to agree with Col Kaddafi’s statement that he was attempting to keep the “rebels” from occupying the oil plant. Ok so I’m sceptic, but am I alone on this? According to the mail newspaper today “The world supports a no fly zone”, that should read the world minus one. The point I’m making is just because we don’t agree with another countries regime or even our own governments if you happen to live there, does that give us right to wage war against them. If the stories are true of the abuse Col Gaddafi has put his people through then I certainly don’t believe we should just sit here and ignore it but there are democratic ways of dealing with conflict are there not. I was taught that in primary school! So as you can keep up to date on the latest developments in Libya I decided this would be a good time to build and demonstrate retrieving and displaying Tweets form Twitter for a given search term. This is starting to really get me worried now. It’s obvious from Tweets that many people all around the world but especially the UK that we do not want this. Already there are protests being planned against the bombing of the Libyan people. Surly enforcing a no fly zone simply entails shooting down the offending aircraft not completely crippling the country and leaving it 100% defenceless. Every country has a right to defend itself dose it not. We are told Col Kaddafi’s air force is outdated and out military is far more advanced, if that’s is the case surly shooting down any aircraft that break the no fly zone would be easy. I see reports of 100 Tomahawk missiles being used which apparently cost $1 Million each! This is not enforcing a no fly zone it is outright WAR! And another thing if this is really about saving lives then any action the west take should not risk a single life yet we hear already 60 + have been killed in the raids. Nobody even has any proof how many people Col Kaddafi has allegedly killed but ill put money on it that this WAR will result in more.